A thorough introduction to balance equation concepts. Geared for the course offered to chemical engineering majors in their sophomore year. Develops a framework for the analysis of flowsheet problem information with extensive use of degree-of-freedom analysis. Presents systematic approaches for manual and computer-aided solution of full scale balance problems. Provides a detailed development of the structure, properties, and interrelationships of species and element balances based on the algebraic view of reaction-stoichiometry and the rate of reaction concept. 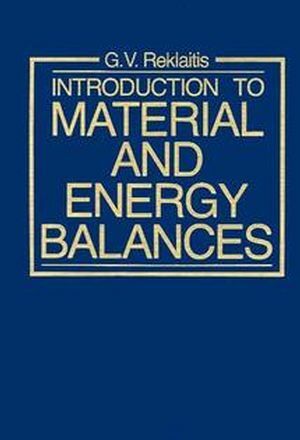 Gintaras V. Reklaitis is the author of Introduction to Material and Energy Balances, published by Wiley. Material Balances in Non-Reacting Processes. Species Balances in Reacting Systems. Material Balances in Process Flowsheets. Energy Balances for Nonreacting Systems. Energy Balances for Reacting Systems. Material and Energy Balances in Process Flowsheets.